Author: Pohl, Frederik Set In . . . In a vastly overpopulated near-future world, businesses have taken the place of governments and now hold all political power. States exist merely to ensure the survival of huge transnational corporations. Advertising has become hugely aggressive and boasts some of the world's most powerful executives. Through advertising, the public is constantly deluded into thinking that all the products on the market improve the quality of life. However, the most basic elements are incredibly scarce, including water and fuel. The planet Venus has just been visited and judged fit for human settlement, despite its inhospitable surface and climate; colonists would have to endure a harsh climate for many generations until the planet could be terraformed. 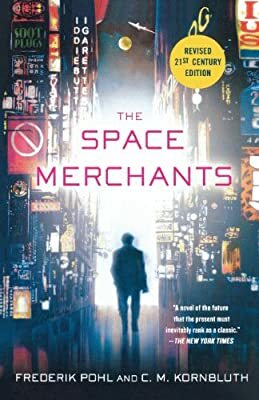 Mitch Courtenay is a star-class copywriter in the Fowler Schocken advertising agency and has been assigned the ad campaign that would attract colonists to Venus, but a lot more is happening than he knows about. Mitch is soon thrown into a world of danger, mystery, and intrigue, where the people in his life are never quite what they seem, and his loyalties and core beliefs will be put to the test.